This week we are going to talk about inherited wisdom, while exploring the significance of the Menorah instruments and the precious oil with which the lamps were filled. All throughout the detailed description of the creation of the Mishkan (Tabernacle) we have heard that G-d has given abilities to the chachmah – the wise-hearted, people of wisdom and understanding. (see Exodus 31; Parshat Ki-Tissa 2013) But what do we mean by wisdom? This is what we are going to explore, because wisdom is something more than mere “knowledge.” It is something that most often comes from personal experience. Experience which is often transmitted through our traditions. Here near the start of our parsha, during the listing of all the items that need to be constructed for the sanctuary, we have this description of a complete Menorah provided for us. It is right in between the listing of the components from which the Mishkan was to be built, and the mention of the sacred items such as incense and the anointing oil (which we discussed last week, see Parshat Ki-Tissa 5774). As we see from the description offered here, this candelabrum – the Menorah – it was made of a huge mass of gold. Most of us can picture what is needed to construct a functioning menorah. We need the candelabrum and the lamps which need to be lit. We understand that they also need to have oil for it to function, which we will further discuss as we continue. However, there are certain things which some people do not so quickly recognize in this description. Right along with the mention of constructing the Menorah we are told that G-d orders the making of the matching implements, the utensils (keilecha). “And he made seven lamps, and the wick-tongs and the ash-scoop, of pure gold. All of the Menorah and its various parts were made of one huge chunk of gold. From it was beaten the candelabrum itself, as described in the previous verse (v.22); it is one entire piece, hammered into shape. In Rashi’s commentary for Exodus 35:14, here he used an interesting word to describe the lamps of the menorah. He used the word “לוציי”ש” – luzes (or maybe even, lozes) for lights. This word could be just another translation into old-French of the 11th Century, but also any other language as well (notice the wording, בלעז). Though it might seem easy to assume that because this word sounds a lot like a Spanish word, it is Ladino (Judeo-Spanish). However, this is not the case. It actually appears to be based on the Latin word for lamp – or a lucerna, as shown above. While Rashi did live in Iberia, he was a French Ashkenazi, of a different cultural and linguistic influence. Also, the Ladino translations of the bible most often use the word “קנדילאש” – candelas, which does not necessarily mean the same thing as our English term “candle,” but often lamp instead; the same as lucerna, in Latin. Here this verse tells us about the additional seven lamps individually crafted to go on top of the candelabrum, and filled with pure olive oil. In order to position the lamps in the correct direction – with all the wicks facing inward toward the center of the Menorah – it was required to use the wick-tongs. And later when cleaning and redressing the lights after their use, the ash-scoop would be used to clear the burnt remains from the lamps. And then the lights are reset again using these wick-tongs. One of the reasons why we miss the point of the usefulness of these items, is because we don’t have the presence of these items as part of our Chanukah menorahs. 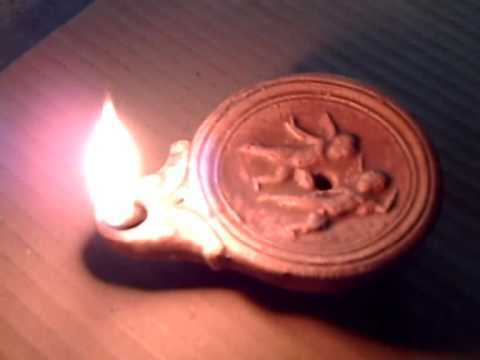 Also, today most often people use wax-candles instead of the original oil lamps. In the lack of practice, or experience with oil lamps, the actual usefulness of these items doesn’t really appear obvious to most people. However, even though these implements might seem practical for people who regularly utilize olive oil lamps, our lights are only temporary and so do not need to be constantly tended and trimmed like the Temple Menorah. Furthermore, on Shabbat we are not allowed to fix the wicks of our nerot (lamps, lights). If they go out or begin to smolder we must just let them go out, we are not permitted to tend them on the sabbath. The need for these items is mentally superfluous for us. But the Torah and the rabbis harp on these points because we are not just talking abstractly about a sanctuary, as part of a mental exercise. We need them, because in a real world they are useful. One of the reasons that these utensils are also not so necessary for our own sacred light sets is because we take special care regarding the oil itself, in order to make sure we do not need to tend our lamps or trim our wicks. If we look in the halachic works, like the Shulchan Aruch and Mishneh Torah, some of the most heavy discussions we have is surrounding is the quality of the oils (shemen; oils, or fats such as tallow-wax) and when one needs to use new wicks. We learn how it is that the finest and purest oil, the best grades of oil, burn steady without separating. Also on special nights such as Shabbat and holidays we are instructed to additionally use new cotton wicks, as they are able to soak up a fine oil better. Use the best oil and wicks so they burn without incident, providing a steady and soothing light until they extinguish. Lights which burn without flicker, which we think of as symbolic of competing and fighting which we want to also avoid during our sabbath’s rest. We consider the idea that we should burn steady and strong, without neither flaring up nor smoldering out. Aspiring that our names and honor be good, as good and fine as pure olive oil. 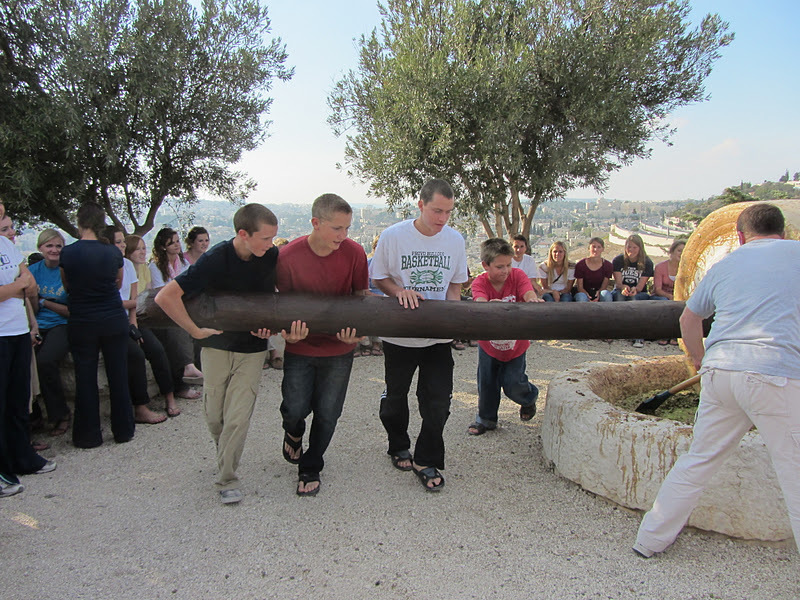 (see Parshat Mikeitz 2012) For all these reasons, traditional people prefer oil lights. I would encourage people to take a look at the many halachic works regarding the details of lighting of nerot – of lights. Their instructions offer us some practical life experience many of us miss today. This is also something helpful for my many friends who are also reclaiming the ancient tradition of lighting with oil lights for themselves. The oil of the Menorah. It is last, but not the least, among the Menorah dressings that we will address. Now interestingly, most of the knowledge and wisdom I have to teach about olive oil doesn’t actually come from books. It comes through experience with making olive oil. And the oil for lighting: That too required wise-hearted [people] because it was different from other oils, as is explained in Menachot (86a): he picks it [the olives] at the top of the olive tree, and it is crushed and pure. Rashi asks us to remember the Talmudic discourse regarding this matter of making olive oil. We are taught there in detail, the olives are picked from the tree starting from the top. A tree is harvested from the sun-beat top olives, working your way down until you get to the bottom olives. Three harvests from a tree in total. Working your way down until all that is left is softened olives below, so soft that they must actually be sun-dried before they are pressed for oil. This systematic way of harvesting helps maximize the output of oil and reduces spoilage. Furthermore, different grades of olive oil that are produced from each harvest. During the first pressing the olives are milled, basket-ed and drained of oil. The second is a pressing with a wooden mortar, a pressing beam made of wood. The third pressing would be once again through mill to get any last bit out. This is how olive oil is extracted today. Of course the first pressing is the best. This is oil of this purity and wholeness is akin to the claims of the extra-virgin olive oil grade of today. Then the purity and usefulness goes down from there, the more times you press the fruit. How can this be? Our Talmudic text doesn’t really elaborate. It just tells us not to soak the olives in water. But it’s not exactly clear otherwise. Only a skilled craftsmen of oil would understand the meaning of these instructions really. When I think of the skill and complexity of olive oil making, the first person that comes to mind is actually my grandfather. He was the one who taught me how to make olive oil. I think back to when my grandparents lived in that old small house, the pink one with all the olive trees in yard back in Mexico. My grandfather would lay down tarps under the trees, hand us baskets, and we would go up into these thick trees to pick the olives. 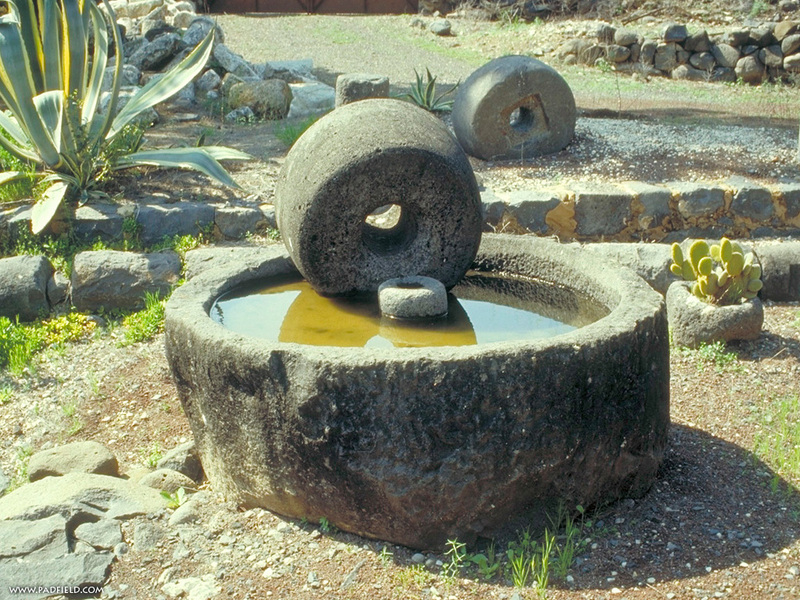 The raw olives would then be taken and pressed almost exactly like the process described in the Talmud. Notice there is no previous soaking or processing that is involved or allowed in making of olive oil. As mentioned, we are not allowed to soak the olives. Soaking and brining them makes them edible, but it makes them impossible to press for oil. The reason is because as we juice the olives we are not just removing oil. Along with it we are also removing all forms of vegetable fluid from the fruit; water. The more times you press the fruit in order to get the most out of them, the more of the pulps water is released and flows into the mix with the oil. Thus the last pressing of oil is the least useful, often separating between oil and fluid in use, making it inferior as a fuel for oil lamps. The fluid would eventually snuff out the oil lights. However it is edible, just not as tasty as the golden first pressing. When we look at the Talmud in this light, it thus makes very obvious sense why we are told the first pressing is fit for the Menorah, while the second pressing is fit for the grain offerings. Not only was the oil used for lighting, it was an essential ingredient that was needed for the sacrificial offerings. Being mixed in with the grains offerings on the altar as well. One of the reasons that we read of the mention of the olive oil first, when the items are ordered by G-d in the first account, is because the oil is a necessary prerequisite to making the incense and anointing oil that are next mentioned. However, the olive oil is mentioned last during the account of the actual construction of the Mishkan, because it was the last and essential craft needed in order for this tent of light and offerings to function. Without it you didn’t just lack light, you also lacked the ability to sacrifice as well. Many people get “bored” as they read through all the details of this. The points of all this, to mere religionists, is pretty dull and seemingly useless because they have no life application for it. It’s merely a mental game. All of this seems cold. And to the speculative its even demanding and cruel in their minds, that for some unknown reason G-d only wants the best oil for His Menorah. It’s easy to come to strange conclusions until someone has personally shown you the how and why of this craft. The point of such descriptiveness is to demonstrate that there is a real practical nature of these Torah instructions. It’s about real deeds, not myth. We aren’t talking about abstract spiritual ideas, we are talking about a real lifestyle and its cultural ingenuity. וְאַתָּה תְּצַוֶּה אֶת–בְּנֵי יִשְׂרָאֵל, וְיִקְחוּ אֵלֶיךָ שֶׁמֶן זַיִת זָךְ כָּתִית—לַמָּאוֹר: לְהַעֲלֹת נֵר, תָּמִיד. When we talk about these things, we aren’t talking about lessons that were useful at some point in the past. These lessons are here for “v’yik’chu elecha / for when you bring.” We focus on the “when,” as a future and continuous act that stretches to us today. Our Discussion Point: I have learned so much from my family growing up. Most often from the elders of my family, they loved to show me everything because I was always curious and easily engrossed in their activities. So I have so many good memories, and a lot of life skills that I wouldn’t have otherwise. In fact, I’m more knowledgeable about our culture and traditions than even my parents, who didn’t have the same space and time to explore their roots as I did. My grandparents were mindful to pass the language, the arts, the recipes, the crafts and the stories to me. Show me how it was done, so I could show the others. We all should ask ourselves, are we passing on our culture and traditions? Are we passing on our cultural and religious know-how to others, so that it doesn’t just end with us? Can we reclaim culture over consumerism? What essential tasks or crafts do you want passed down through the generations, which your family and community would not be the same without? Though we are in an age were we are out of touch with hands-on cultural expression as in days gone by, can we reclaim some of that organic cultural diversity for ourselves? What have you learned which you want to pass on? Galbanum: Why include this vile fragrance? This week we are going to explore Torah through our sense of smell. We are also going to discuss the different types of scents; good and bad, sweet and sour, pleasant and bitter. We will discuss the way that fragrance can inspire people’s moods. We will also discuss how at other times in our tradition a scent can be used as an example of certain type personality. In this parsha we get beyond just the details of the construction of the Mishkan (Tabernacle), and now we get into the practical measures to make it a working reality. In last weeks parsha we had presented for us the instructions for making the Ketoret – the Temple Incense (see Exodus chapters 25 and 35). Now in the same vein, this week our parsha is discussing the making of the Shemen Meshechat – the fragrant Anointing Oil (שמן המשחה) which was needed for the inauguration. This parsha will also detail how the incense and oil are to be used. Both of these discussions are very similar. They are both sacred compounds which were made of herbs, spices and resins; made into exclusive blend which could only be used for ritual purposes. They were also made of much of the same herbal products. And of cassia, 500, after the weight of the sanctuary; and a hin of olive oil. וְאַתָּה קַח–לְךָ, בְּשָׂמִים רֹאשׁ, מָר–דְּרוֹר חֲמֵשׁ מֵאוֹת, וְקִנְּמָן–בֶּשֶׂם מַחֲצִיתוֹ חֲמִשִּׁים וּמָאתָיִם; וּקְנֵה–בֹשֶׂם, חֲמִשִּׁים וּמָאתָיִ. וְקִדָּה, חֲמֵשׁ מֵאוֹת בְּשֶׁקֶל הַקֹּדֶשׁ; וְשֶׁמֶן זַיִת, הִין. וְעָשִׂיתָ אֹתוֹ, שֶׁמֶן מִשְׁחַת–קֹדֶשׁ—רֹקַח מִרְקַחַת, מַעֲשֵׂה רֹקֵחַ; שֶׁמֶן מִשְׁחַת–קֹדֶשׁ, יִהְיֶה. The first being the boiling of the spices in oil, thus releasing the scent directly into the oil and then straining out the spices. This process I understand well, it is a process that people like myself commonly use for extraction of the medicinal substances from natural products like cannabis (As you know, I have been battling a life threatening illness. See a demonstration of medical marijuana extraction into fats in this video, “How To Make Cannabis Butter, Cooking With Marijuana”). This is the method suggested by Rabbi Meir. The second option is actual perfuming, in which you merely capture the scent of the spices alone through contact and exposure (thank you Rabbi Juan Mejia for enlightening me on this!). This is something new to me, but interesting to learn. In the old days perfume was most commonly made by taking fresh spices, flowers and hydrated barks and placing them directly into oil. (see this method explained “Making Essential Oils at Home”) Yet another method of perfuming still relies on contact transfer as well. It is when the herbs are placed in water to release the oils, olive oil would then be floated over the surface to capture the essential oils and fragrances of the spices, the mixed oils would then be skimmed from the mixture or distilled off; the water in the mixture is very slowly boiled off, leaving only the fragrant substance. This latter method is suggested by Rabbi Yehudah. I find this topic fascinating, because it a good demonstration of how much knowledge we have lost in the consumer age. In days gone by, people readily knew how to made extracts and perfumes, but in the lack of practice the details are not understood by most of us today. I’m not going to take on that debate at this time, as we don’t really know the final answer to the question of which method was used anyhow. Both methods compromise a certain precondition, either the purity (clarity) or the need to be throughly mixed. What we do know is that what ever method used had to get the essence of 75 pounds of spices into a hin of oil; about a gallon of oil. Either method is quite difficult and requiring great care, considering in most cases even anything over a 1% solution of cinnamon alone could burn the skin! The creation of this composition, for now will have to remain a mystery. We are further told that we are not allowed to recreate this formula of anointing oil. We cannot experiment with it to find out. It is sacred, and should not be poured directly on to human flesh (al basar adam lo yisach, see verse 32). Do we mean it should not be poured, just rubbed on to a person? The next verse seems to clarify by suggesting we cannot place this on foreign, non-priest, (al zar, see verse 33); it can only be used for anointing the priests. This is what we appear to observe concerning the oil, which was to be placed directly on to Aharon and his sons to sanctify them for their priestly service. Now it is most obvious to many of us why it is so important that this anointing oil be fragranced, as in our tradition spices are of great significance. Spices are said to awaken the soul, and enlighten the eye. For this reason we use spices during Havdalah – to end Shabbat we inhale the spices deeply to reawaken our souls for the week of labor ahead. The pleasantness of spices moves us in a way that is inspiring. But what about spices that don’t smell so good? In fact, many medicinal herbs do not smell nice. Notice it is their horrible smell which also makes them unpalatable, just too awful to want to be tasted. Things which are too bad to drink or even smell on their own. Actually in our parsha, we are faced with just that. This discussion is also in close chronologically with the Talmud as well. This topic arises surrounding the equally sacred Ketoret incense. In the production of the Ketoret, there are eleven spices that are used to create that blended compound. The spices and mixtures were prepared by grinding them down very fine, and then mixing them together by spatula blending. Turning over and over, utill mixed. All the ingredients seem to make sense except for the galbanum. That is one of the substances that we understand the least, but which is the most discussed among the curious. There is a reason why we want to understand this, as our rabbis are also of the opinion that small amounts of all of the ketoret spices are placed into the anointing oil as well. Galbanum would have naturally have been one of the ingredients. Today modern science sheds some light on the origins and possible usefulness of this herbal ingredient. However, today people still make extracts of galbanum and place them on neck, temples and on spasming muscles. 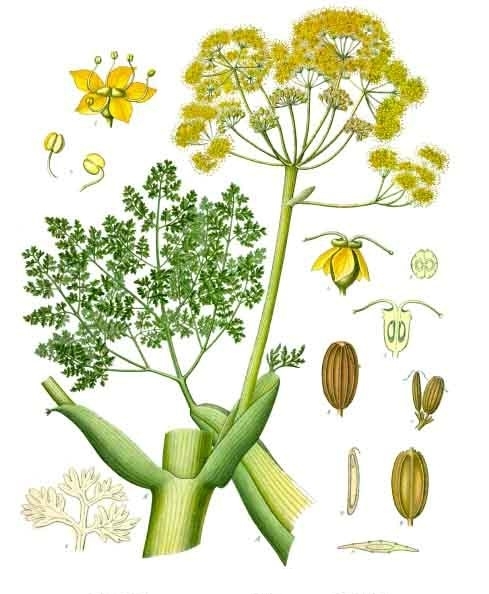 The problem with using galbanum is that it is terribly hard to use, since it smells so terrible. It‘s odor is described simply as “intense green,” by most people. A green and almost piny fragrance. However, raw and in its purer form, people merely describe it as smelling like turpentine. There is no way around it, process it all you want, the stuff is awful. So why is it that we are asked to use something so foul and bitter smelling in the incense, and thus in turn also include it in the anointing oil? Here Rashi brings us back to the Talmud, to the same sections we were previously discussing. And in this commentary we have it reaffirmed for us, we are all in agreement that this substance smelled “ra,” it was a bad and dare we say “evil” smelling substance. It smells nasty, that’s what ra means. It doesn’t get much more descriptive than that. And this is why we most often discuss galbanum, people want to know why this vile smelling ingredient needs to be included. Our rabbis, since as far back as any of us can remember, have taught that the reason we include the chalbana is because the mixture would be incomplete without it, it just wouldn’t smell right. The rabbis not just make the point that it needs to be mixed in with other substances to be acceptable. But that the other spices of the Ketoret would themselves not smell right unless this bitter ingredient was included in the mix. This re’ach ra – this evil smell. You know more often than not when I talk to people about going to synagogue or joining in a Jewish event, I often have people tell me that they don’t belong. Few will tell me that they are just too much of a sinner. But that’s what many suggest. Instead many people instead suggest that they are just too bitter of a person to fit into a community. There is no place for them, they aren’t needed. Our tradition would suggest that even if it were true, that one could claim that either themselves or some other Jew is just too bitter, in fact too sinful of a person to be part of the Jewish community; that is the very reason why that person needs to be included. Just like mixing incense or perfumes, a really good fragrance is not just one type of smell. It’s nice, but that will never do. In a good mix, in a proper blend we have several smells mixed together, each complimenting each other. On their own they are lovely, but together they can be something amazing. It’s no different when it comes to community, the personalities can often temper and compliment each other. It is good that we be in the mix with other Jewish people, even us sharp personalities like myself. Other people can help take the edge off us. Our friends and loved ones bringing balance to us. But even more so, we need to all recognize that we as a community are incomplete if we don’t have some of those more intense and strong personalities that most people would rather avoid. Even those bitter persons. We need to have some of their sharpness and distinctive intensity, they accentuate us. They are needed to bring balance and wholeness to us all. The Talmud, which Rashi is paraphrasing here in his commentary, actually takes it one step further. 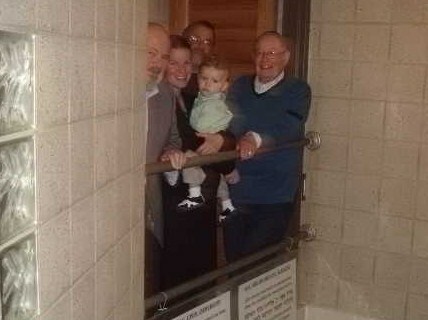 We are taught that we are not to look down on the person who comes to be included in the prayers of the Jewish people. When they come on holy and auspicious days like Yom Kippur, we don’t belittle them. Think about it, what point is a day of fasting and repentance if the sinners where not included? We need their prayers to be part of ours in order for our supplications to be complete. “The incense consisted of ten spices or perfumes with good fragrances, and an eleventh spice, Chelbenah-galbanum, with a vile odor… which alludes to the elevation of evil back into the realm of the holy. Are you bitter? Then you have a place with us! Are you an unpleasant person? The Jewish community needs you! Are you a sinner? Then we need you to be part of this as well. Maybe you feel like the 11th ingredient, the odd-man-out; but you aren’t useless, you are part of our essential make-up. We are incomplete without you. You are part of the blend that makes the Jewish people so unique and so intense. Your distinctiveness is needed to help elevate the spiritual and communal experience of the rest of us! Want to experiment with some of what we have learned today about the production of oils and perfumes? As we have discussed, there are several ways of transferring fragrances into oil. If you can make iced tea, you can make perfumed oils. 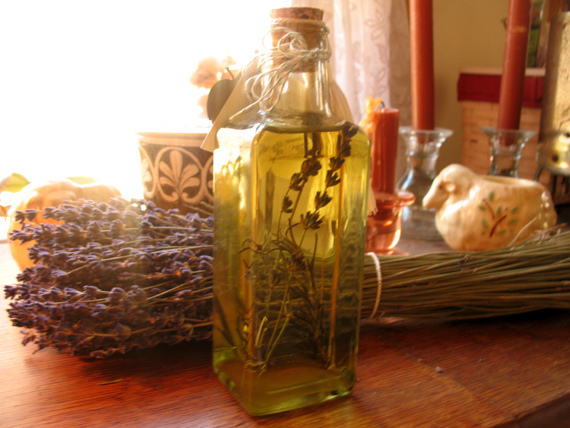 Learn how to make Lavender Scented Oil today from the video below. Conversion to Judaism is a topic that I have found myself discussing more often in recent years. Not just because of my experience with conversions and converts of diverse backgrounds, but more so because there are more people than ever brave enough to seek out Judaism. And quite often, people become interested in conversion. I love to help people in this very important journey. More often than not I’m usually talking about the hardships imposed on converts to Judaism. I’m frequently calling out the system for the confusion, politics and suspicions which makes it more difficult than it needs to be. It’s a topic we all discuss, as this is quite possibly the most glaring problem in our community. Rarely have I had to call out people for being unethically excessive regarding offering conversions. Its even rarer that I have had to call out people for offering fraudulent conversions and using deceptive outreach tactics, until recently. Patrick did spring into action and respond to me immediately after my write-up surfaced. After he communicating to me a sense of hurt and disappointment over my charges, I awaited a promised dialogue on this matter. In his first messages he did not hesitate to admit that by his own estimation 75% of the material was factual, but that I had just mis-characterized some things and he wanted to explain. However instead of the discussions he promised, he immediately deactivated his own social media profiles, and began deleting the materials and videos which I cited. As most people pointed out, this was an odd move for a person who makes his living with an Internet presence. Patrick’s mentoring parties also started restructuring their online presence in order to delete evidence of their actions as well. Among them again is the front-business for the expelled Rabbi Johnathan Ginsburg, under the name of ConvertJudaism.org and the Chicago Conversion Beit Din. Today I will present you with some of what they have been suppressing and deleting. I will also present materials they haven’t deleted, and provide you access to a few permanently archived copies of their materials to reference. I will also explore how this is not just a former instance, but a current and active attempt by knowingly collaborating parties. People who are offering fake conversions to defraud unwitting persons online. First off, in the matter of conversions offered by PunkTorah/OneShul. I do not wish to put words in the mouth of Patrick “Aleph”, their director. However, it was communicated to me directly that his in-house conversion program would most likely not be going forward. He cited personal hardship and a lack of time to commit to it. And a candid admittance that he wasn’t sure his program would really be helping anyone. While he didn’t actually address the issues I raised, his decision to not go forward with his proposed program is much appreciated and respected. I likewise have appreciated his toning down of his material’s for his Darshan Yeshiva, to focus on personal benefit and not about becoming pulpit-ready. However, there is one issue that he did directly address. His involvement in directing people to the shamed Rabbi Jonathan Ginsburg. In private emails with Patrick “Aleph” he went on to assure me that he had stopped sending people towards Ginsburg as soon as he became aware his status. He didn’t say when he became aware. However it is confirmed that he did send his own group leaders to Ginsburg in the past (many of the leaders are not yet converted), and that he never warned them of Ginsburg’s ban-status (most only hearing this directly from me last month). Some of them were devastated that they were perusing a fake program, while others among his on-line class hosts went on to expressed shame that they had themselves recommended Ginsburg for conversion to other interested parties in their capacity as PunkTorah leaders. In the face of these charges I was assured by Patrick himself that the relationship with Ginsburg had long since been severed, and that he would not be recommending this program anymore. Patrick says once he knew of the charges against Ginsburg he stopped sending people his way; that is his claim. And it is a complete lie. ‘The Chicago Conversion Beit Din advertises that it will provide its students with a “Conservative Bet Din.” The Rabbinical Assembly, as the world’s sole membership organization of Conservative/Masorti rabbis, wishes to clarify that, as a body, we do not endorse the work of the Chicago Conversion Beit Din and will not endorse conversions completed under its auspices, for any purpose, including to seek citizenship in Israel under the law of return. Now, the connection of Patrick “Aleph” is more than as a simple recommendation akin to passing on someones business card to a friend. 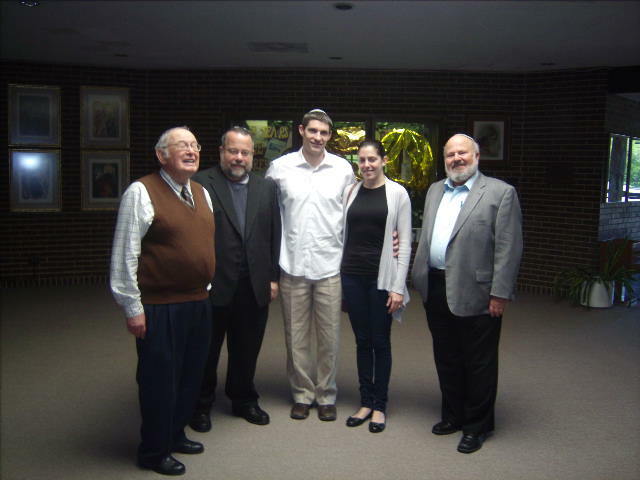 Patrick’s first “ordination” comes from Rabbi Jonathan Ginsburg and his organization, where he claims to have received ordination in para-rabbinics himself. Patrick has also made promotional videos for Ginsburg’s conversion program as well (Note the URL of the website in Item #1, is ConvertJudaism.org). So what do we know about ConvertsJudaism.org? Let’s explore just some of the evidence that shows the level of deception and carelessness shown by those involved in this scam. Fact: ConvertJudaism.org was founded and developed by Rabbi Jonathan Ginsburg. While Jonathan Ginsburg’s name is mud, and he is not recognized as a rabbi for any authoritative purposes any longer in the eyes of the movement he claims to represents (Conservative), that hasn’t stopped him from operating. He has merely pushed his two other cohorts forward. But the fact remains, the program is developed and still overseen by Ginsburg in the noticeable background. See the item on the right. 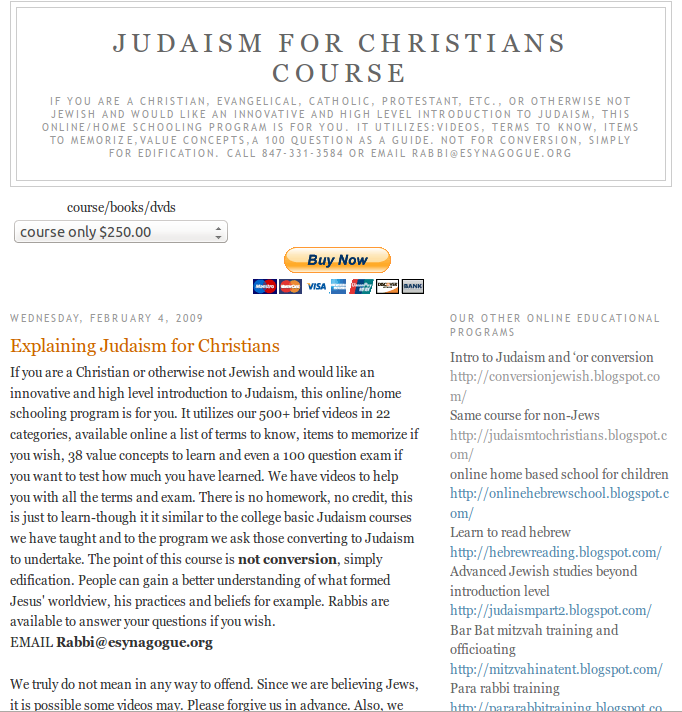 The copyright here on a ConvertJudaism.org page says “Developed by Rabbi Jonathan Ginsburg.” Please take notice of how ConvertJudaism.org, is also using a copyright disclosure from eSynagogue.org. The latter being another program run with the help of PunkTorah board member “Rabbi Rob Thomas.” In an interesting but strange side-note, Thomas is also concurrently a board member of eSynagogue. Thomas directly mentions being ordained by JSLI – another fake, online conversion/ordination school attended and promoted by Patrick “Aleph.” Oddly, Thomas goes out of his way to mention Ginsburg and his founding of eSynagogue by name in his resume (please refer to my previous article). Fact: Ginsburg has been trying to hide his involvement in the Chicago Conversion Beit Din. Ginsburg and his staff have cheaply tried to use a search and find feature to delete his name out of his websites (thus, leaving odd breaks in type and grammar behind to identify this). He likewise attempted to delete pictures which show him involved. However pictures and videos taken from the active site on January 21st 2014, show that he is actively overseeing the program. While claiming on the header to be supervised by Rabbi Dr. Shlomo Levine and Rabbi Neal Brief, there is no question about who is really running things. Obviously, Ginsburg is still the central pillar of this program. This fact of Ginsburg’s active involvement has needed to be concealed on paper as part of their faulty attempt to circumvent the ban again him. Without regard that their Chicago Beit Din (also listed as Skokie) is disqualified even if he isn’t directly involved, by virtue of being associated with him they are invalid. The fact is the program was developed by Ginsburg. He is still there in the program. Levine might be the supervisor on the letterhead, however there is no question that Ginsburg is still the actual owner/operator. These videos were originally uploaded to Youtube by Ginsburg in February 2013, and were active on his site up until late December 2013. While Ginsburg has gone to great lengths in the past couple weeks to alter their homepages, he still has not been able to delete all of his telling videos from his JewishLearning profile on Youtube. You can also see in many of his hundreds of videos, branded with links back to one of his conversion websites. 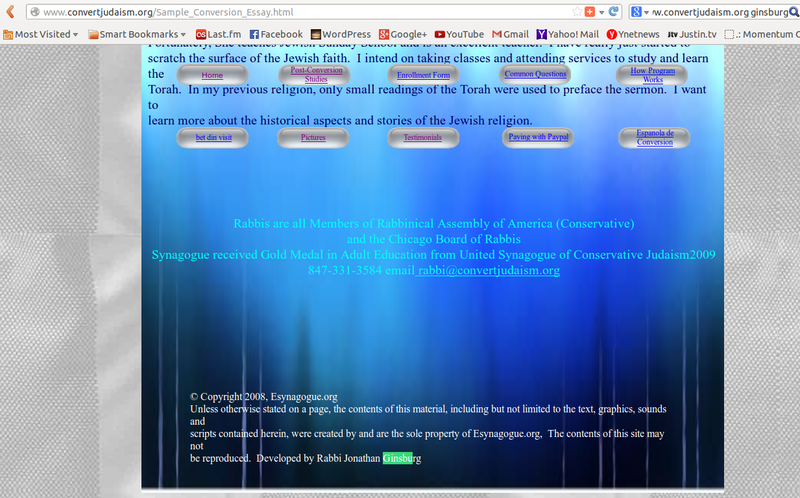 Fact: This is not the only website operated by this Rabbi Jonathan Ginsburg. I say one of the conversion websites, because he has many websites. 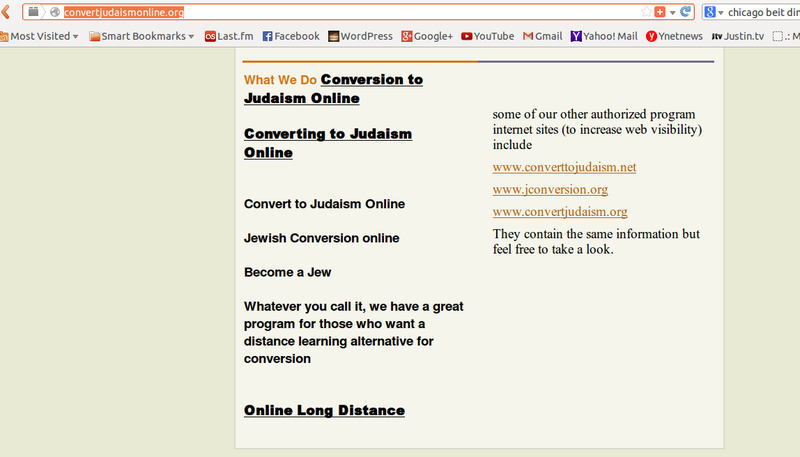 As previously explained ConvertJudaism.org is also the exact same program and organization also advertised at jconversion.org, convertjudaismonline.org and converttojudaism.net. How do we know this? In their desire to have an aggressive web presence, they admit to creating multiple websites and domains. Please note, in order to “increase web visability” (in the image to the left). Interestingly, Ginsburg has also been marketing conversions to the Spanish speaking communities. He even has websites set-up in Spanish to market his program . Likewise, he is very active in promoting conversions outside of the United States. Boasting converting people from all the world including Asia, Europe, South America, Israel, etc. Ginsburg provides a very interesting model, one that is very closely attempted by Patrick “Aleph” up until recently. The idea is to get people converted and then encourage them to seek “ordination” from you as well. (see “Judaism part 2 More online adult Jewish learning“) Ginsburg offers this in the tone of being the obvious next step forward. He doesn’t just have people buy into their fold, but he then make them a marketer and distributor as well. One would think this type of false income would pay-off pretty well for Ginsburg. However, his need to milk a dime out of interested parties normally outside of the auspices of the synagogue goes even further. He also offers his Introduction to Judaism class for Christians. He has a dedicated website specifically for teaching Judaism to Christians. Ginsburg is making money all around. Taking Christian’s money and making them more interested in Judaism, taking people interested in Judaism and making them into Jews for a fee, and then more costly taking new Jews and making them leaders and rabbis. This is an idea that is reinforced in people as the outside Jewish communities do not accept his followers and as a result they feel they must invest themselves deeper into the programs he offers. Fact: Patick “Aleph” and PunkTorah by way of Darshan Yeshiva is still sending people to the Chicago Conversion Beit Din of Ginsburg and Levine. One reason this is all so egregious and upsetting to me is because Patrick “Aleph” has not just lied to me personally, telling me he had stopped engaging in this long ago. He knowingly and with premeditation has been sending people that direction all along. Premeditation and intent is established because it is clearly evident that once he became aware that Ginsburg’s name was not marketable last spring, he then kept in step with the Chicago Beit Din and inserted Rabbi Levine in his place and kept up business as usual. Patrick “Aleph” cannot claim simple ignorance in this matter. Keep in mind he was first ordained by Rabbi Jonathan Ginsburg. It is inconceivable, in fact impossible, that Patrick did not know when promoting them as an authority for conversions that Ginsburg and Levine’s program were one and the same. Patrick “Aleph” has been giving out the same website as he had given out before when hosting videos with Ginsburg, the same phone numbers he has given out before, the same email addresses as previously, etc. He cannot honestly expect the community to believe that he did not know that he was sending people to the exact same institution. We are talking about the office of his mentor and teacher, the officiate of his first ordination! Of course he knew where he was sending people. His cheap excuses insult our intelligence. Furthermore, it offends my personal sensibilities as a punk rocker as well that Patrick “Aleph” has been promoting his work as a counter-culture, punk, open source and DIY approach to Judaism. (see “The Big Jewcy: Patrick Aleph“) But that isn’t true at all. See a bloger’s previous critique of that here. Also take notice of his disinterest to cooperate and really be Open Source when encouraged by Jewish professions in the comments sections of an articled titled “Do-It-Yourself Prayerbook“). He uses elementary punk terminology, while dismissing punk’s real virtues and values like corporate slime. In the end, what facts reveal is that he has been part of a marketing scheme to try to funnel in people interested in the Jewish faith and make them into paying customers (now for only $4.99 a month to study Chumash at Punk Torah! Or $50 a month to join Ginsburg’s “online shul”). To say this program reeks of commercial capitalism, that’s putting it lightly. (see the “discounted” offers at, “Start your Jewish journey by enrolling today“) But that still isn’t my real issue with this program. My real issue with this approach is that if offers false hope to people, and then sells them a conversion that is useless for them to actually utilize for any purposes. People who are selling conversions that are not only invalid in Israel, but are also invalid to anyone else that closely inspects them anywhere. At over $650/person (see “Convert Judaism: Paying With PayPal“) they are converting people they have never met and sending back to communities, unprepared for the reality of the shame they will face once the fraud is caught. These people are being set up for a crisis later on when they go to do something like get married, or want to apply to a Jewish studies program, or even even further down the line have their kids attend a Jewish school or camp. Setting people up to later being told they are not halachicaly Jewish down the road, when the fake conversion rabbi is long gone. They give no consideration for how crushed and defrauded the person is going to feel. The convert will already be back in their home town or country, and the bills would have long since been paid by PayPal. There is no consequences generally for the perpetrators of such scams, just for the person they sell this forgery to. People who rarely speak up out of their shame of being judged for being gullible. This is not right, as this is a most terrible example of religious corruption being perpetrated here which has terrible emotional consequences for the victims. Bottom Line: False conversion schemes like that of The Chicago Conversion Beit Din and the ill-fated attempt by PunkTorah/Darshan Yeshiva are part of the problem, not part of the solution. The fact, is we do have a lot wrong with the conversion system. Actually, it’s worse than its ever been before. One of the problems for converts is that there is often a distrust of converts that goes beyond the issues of halacha. There is a general distrust, based on the assumption that progressive rabbis are being too easy, lenient and are merely selling conversions instead of actually enculturating people in Judaism. Of not having enough standards. Of course the progressive rabbis charge the same, that the Orthodox system is so broken that some are selling conversion as well, without observance of proper standards; and they are correct in this matter as well. We all know and have heard of these such instances, its not hard to imagine (see “Special Sale on Conversions” at Ynet). But the problem is that in the midst of such chaos there are real people who are getting hurt and lost in this battle over “Who is a Jew.” And in the battle of who is a rabbi, and who is a proper rabbi. And which rabbis have enough clout to do conversions. And then there comes this story, as a horrible case in point which displays both abuse of the rabbinate and of the conversion process. A case which through its own bad form and example seems to validate the suspicion and doubts out there. This soils the dignity of the rabbinate and of the convert alike. Instead of being brave halachic champions who are helping the rejected and needy, people like Ginsburg and Patrick “Aleph” are actually perpetuating the sense of distrust in converts and conversions courts. The greater issue is that these parties mentioned are not authorized, nor are they dignified enough to testify on matters of personal status. They are people who because of their dishonesty and yet unrepentant pursuit of this scheme are not honorable enough to be trusted. They cannot be believed even as witnesses in our communities, let alone be recognized as judges and teachers in matters of Jewish law. If Mr. Patrick “Aleph” Beaulier feels that he is ready to move forward honestly and ethically as an upright member of the Jewish people I feel that he should make some real steps towards redeeming himself. Shut down the Darshan Yeshiva, and donate the money he asked for to build such programs and give it back to the Jewish community as restitution, the spirit of which is spoken of in this weeks Torah portion Parshat Mishpatim. Furthermore, give back all the contributed material that was provided by members of the group, returning it under a Creative-Commons Zero Open-Source licensing so they may utilize this material themselves and distribute it for the public use of all the Jewish community. Liberate the material as a free resource for the Jewish community. Work of a community based team should not be pay-walled in this fashion. I would also ask him to hand over the PunkTorah concept and the control of this new independent cultural experience to the members of the community who helped build it. Do something really revolutionary, and stop treating the concept as a trademarked and corporate idea he owns and let it grow organically with the people who have built it up as their community. Lastly, Patrick “Aleph” should stop calling himself by the faux title of “rabbi” and sit down as a student, submitting to the personal guidance and mentoring of a credible rabbi over himself. When Patrick can start fully admitting who he is and operate himself in a transparent fashion within our community, then we can talk about trusting this person again on a personal level. But it is certainly clear that Patrick “Aleph” Beaulier is not to be trusted as a representative of the Jewish people in any capacity on account of his continuous dealings in bad faith. For more information on Patrick’s “Aleph’s” approach towards conversion and his take on halacha, please see his piece titled, “Conversion To Judaism: Lies, Mistakes and Creating Jewish Identity.” (interesting that a person so crooked and dishonest uses the word “lies” so liberally in his many materials) In this peace he teaches people how to argue that their conversion should be recognized as valid after the fact. His last word on the matter is to arm a person with at Talmudic phrase that he didn’t actually cite or formally quote, saying that if a person comes to a Jewish community and says they are Jewish then they are halachically entitled to be believed. Learn how Patrick “Aleph” has been coaching people on how to pass objection and argue in defence of their status after the fact in this terribly poorly thought out and non-researched lesson. Also take a look at his pieces titled, “Teachings About Conversion to Judaism (according to Winkler).” In this piece he shows his bottom line approach in that discussion as well: “If someone converts before a tribunal of Jews who are not qualified to perform conversion, after the fact, the conversion is still valid. The same applies to someone who was not questioned about his or her convictions or motives by the tribunal and it turns out that the convert converted for ulterior motives, or to someone who was not taught the essentials of Judaism.” Of course, being illiterate in Hebrew he didn’t provide any text or interpretation. But it tells a lot about how his mind works, what type of hurdles he is trying to scale and where he is coming from. For some time Patrick “Aleph” has been talking about wanting to break the system when it comes to conversions and do it a totally different way from what we know today. His first topics when he launched PunkTorah and OneShul was about conversions, its been a central focus for them. But look at how in May 2009 he was already giving everyone a notice of where he was going. 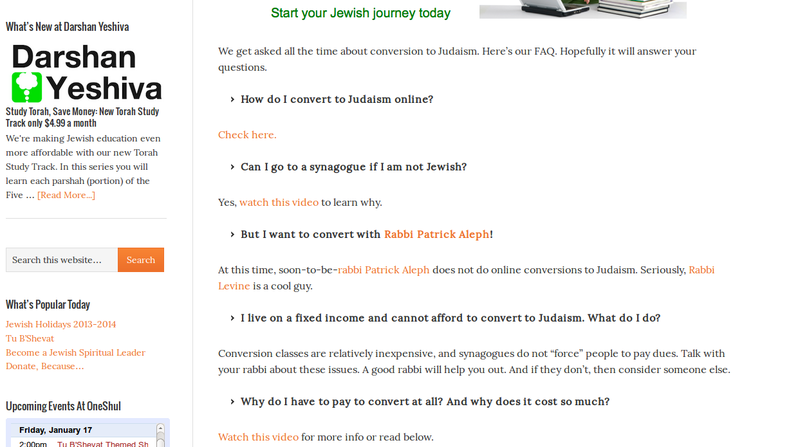 See this article at Jewcy.com titled “How to Save Judaism: Better Marketing!” Patrick was not too shy to state, “Second, we need to improve our conversion rate. In order to do this, we need to change what it takes to convert to Judaism. Telling people that it takes a year, intense study, and a religious court does not bring people into the fold. It just creates resentment. Instead, let’s look at the conversion of Ruth and the trials of Abraham as models for a new form of conversion, one that looks at the heart more than the brain. I would love a time when a person could simply go to a rabbi, say they have a Jewish heart, and could take home a Torah and commentary simply saying, ‘this is us…if you want this, take it’ and the following week be in a mikvah.” [emphasis added] Someone actually asked if he was joking, but of course he never replied. Will Online Jewish Conversions Further the Chaos? [Fair Use Act Disclaimer – This material is for scholarly purposes only! **FAIR USE** Copyright Disclaimer under section 107 of the Copyright Act 1976, allowance is made for “fair use” for purposes such as criticism, comment, news reporting, teaching, scholarship, education and research. Note: While I have a deep respect for the passion and spirit of PunkTorah and feel a close connection to the many great people from OneShul, I feel that intellectual honesty demands that I speak up regarding recent events. While I cannot help but be critical of the leadership and present them in a light that is clearly unflattering, I would like to reiterate my love and respect for each person and their unique challenges. I regret much of what I must say, but I think we are all adult enough to take on this topic with the gloves off. Though I am not a member myself, I feel a special concern for the people who are turning to me in confusion on this matter. Personally I like Patrick, but I just wish he hadn’t made a blind power grab akin to a protestant youth pastor trying to take over a church. Hopefully, this is just a phase. N ever before in my life have I seen Judaism been more appealing to the masses. In a modern age where information is so easily accessible, many people have taken interest in exploring Judaism. And not so infrequently people become so touched and inspired by the values and culture of Judaism that they embrace the Jewish faith through conversion. Though honestly, conversion has never been harder than it is today. The cost, demands and political constraints have never been so heavy. As standards vary between the movements, and between Israel and diaspora as well, the answer to the “Who is a Jew” question has never been more frustrating. Truth is, conversion has always been something looked at as rare and obscure. In the less exciting times few people converted, and even fewer rabbis did conversions at all. Though there seem to be more rabbis doing conversions today than before, there is still whole states and countries that don’t have a local rabbi to serve in this capacity. Harder yet, many don’t have a congregation near them at all. And this is where PunkTorah and OneShul came in, presented as a truly revolutionary approach. If you can’t get to the shul, Patrick “Aleph” Beaulier said they should bring the synagogue to you. With a mix of counter-culture and DIY flair the project helped found the first fully-interactive way to study and hold Jewish prayer services. Programs and services attracted a wide range of involvement and people of various affiliations. Seeing itself as an actual congregation in the true sense, it only seemed logical they would need a leader. Patrick stepped up as “Rabbi” for the organization. In the same manner, it seemed a natural progression that for a congregation that has an amazingly large number of the attendees interested in conversion that they would also seek to Do-It-Yourself in terms of conversions to Judaism as well. But not just performing their own in-house conversions, they have announced that they plan to offer a future conversion study program entirely on the Internet. (see “Coming Soon: Online Conversion“) Why not, as that is their native medium anyhow, right? While this was well received by many of their fans, quietly a lot more went into panic-mode and ran-off as they watched a promising program jump the shark in a most gruesome fashion. No defense of halachic standards, just a statement that everyone else is ignorant if they don’t accept him. Sounds as punk as hell, sure. But also quite childish, and a lot naive. 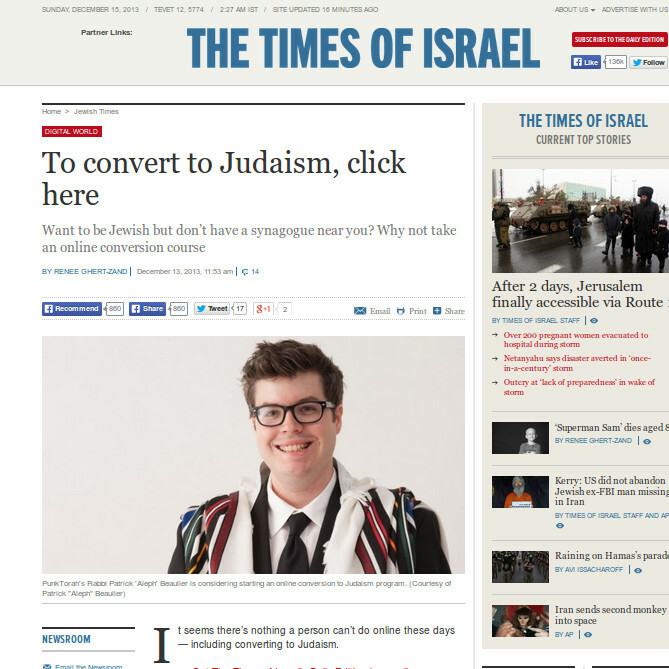 Then it made it to the Times of Israel (see “To Convert to Judaism, click here“). That is when people really panicked. In truth, it was just about the most damaging article imaginable. It coarsely displayed certain elements that have troubled people about Patrick for some time. Strangely he is talking very triumphantly about the exposure, even as harmful as it is to his cause and the reputation of his followers. On a personal note, I have spent much time hearing the pain and counseling bewildered people after this announcement. This was received with great applause by the many people interesting in pursuing conversion through them. But in the background many others were left scratching their heads as to how Patrick and the program could offer something which he couldn’t possibly deliver, while at the same time talking about the potential cost of a program. Who is Patrick “Aleph”? At first people did just accept it as someone being artistic or cute. But little did we know there were more issues related to why this person refused to go by his name. 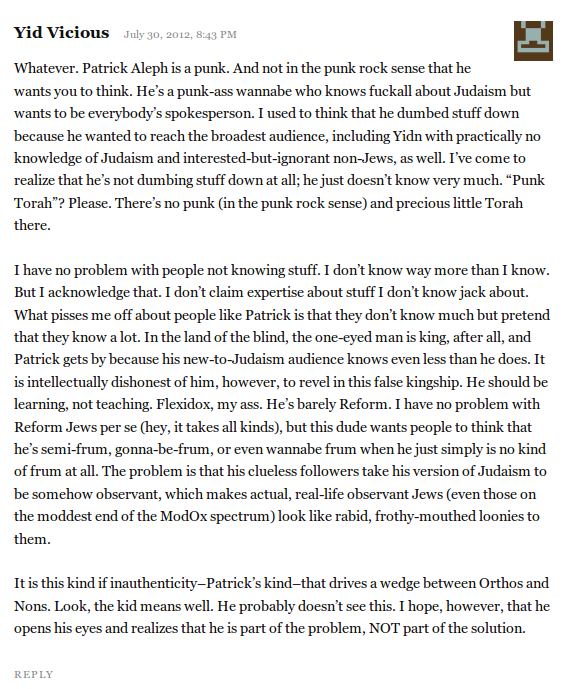 See him try to explain this away at Jewcy.com One can write a whole paper alone on how Patrick’s approach and philosophy was built out of the spasm of one occurrence with a Orthodox rabbi and being asked his full name. There is an incident cited by him several times elsewhere which raises the same discussion as this. He recounts how he was traumatized over having to figure out how to respond in a way without outing himself with a false moniker a or an unJewish sounding name. Someone who is that uncertain and mixed-up about his own identity does not need to be defining the personal status of anyone. It’s even more bewildering because not long ago Patrick “Aleph” posted a piece titled, “Why I Don’t Perform Conversions (Even Though I’m A Convert).” While I wanted to applaud the position of restraint in this halachic matter, I said nothing as I felt that he was priming the pump, just teasing the conversation forward. It appears I was unfortunately right. Two months later he announced that he would do conversions on-line. I am disappointed in the direction he has decided to go, but it is not because I am another person splitting hairs with him on halacha. In fact that seems to be Patrick’s position, that if he does everything properly his conversion is valid (except for the Orthodox, of course). But even if he followed everything according to the Shulchan Aruch (The Code of Jewish Law), unfortunately his conversions are still going to be invalid and non-transferable to another movement. As a religious commentator, I have to say that Patrick and his branding of this program and ordination as “post-denominational” was quite interesting. It’s a term that is almost never used in Judaism, mostly because it always has a bad connotation carried over from the Evangelical Christian culture that popularized that term. To attend a post-denominational congregation in America is most often described as attending a break away movement, lead by a minister that didn’t go to seminary, and that their church has no active oversight or superior governance. They are an island on to themselves, governed by themselves. Let me be clear, the problem most have here is not with his halachic approach as such (since we have nothing to inspect from him so far), nor even his movement being outside of “the establishment.” The issue is graver, that Patrick “Aleph” Beaulier is not properly ordained as a rabbi, despite his claims to the contrary. Working in the different Jewish movements I’ve had time to learn a lot about the business-end and politics of religious governance. At one time I even worked for the Union of Reform Judaism. One of the issues that often came up was the difficult topic of defining who is a rabbi. As new leaders would come into the region there would often be contention over a rabbinic appointment because occasionally temple boards would pick a person that was not officially ordained by any of the recognized movements or institutions. Most often these people had “private ordinations” or came from dubious institutions. I once had an interesting observation while working with the definition of the rabbinate. I was made clearly aware that progressive movements would not even ordain former Orthodox Rabbis out of hand. Unconsidered by most of us who came out of orthodox movements, I came to realize that it wasn’t just a matter of halachic knowledge or chain of ordination through notable individuals. Today the progressive rabbinate most often requires actual post-secondary education, training in pastoral counseling, psychological screenings of potential candidates, completion examinations, etc. As my superiors insisted, “Orthodox smicha lacks most of those qualities.” It was clearly made known to me that they could not become ordained rabbis in progressive movements until they fulfilled those requirements and joined the association. The contention of the Reform movement was that they had higher standards, ones that are standard across the progressive movements. Though in recent years the same type of requirements have become more standard even in the Orthodox Rabbinate of Israel as well. The status of rabbinic authority most often lays not just in the proper education of a person and a one-time ordination, it also requires being in good standing with the governance of the movement for their rulings to hold the weight of authority of the movement’s rabbinate. None of this can be said about the ordination of Patrick, nor is it even true of his teachers and “mentors.” None of them are able to confer “smicha” (rabbinic ordination), because all the programs he has cited are pointing towards rogue rabbis who have basically been forced to resign, or in some cases even thrown out of their movement. Furthermore, as members of the rabbinate they are urged not to offer ordination to another individual. The by-laws of the rabbinic associations generally ban the offering of “private ordinations,” meaning the conferring of the appearance of rabbinic authority on another person outside of the auspices of the movement’s institutions. This is a ban at risk of expulsion, the equivalent of a lawyer being disbarred. But in the absence of active rabbinic oversight, of course there is no perceived risk for these people who are diploma-milling. Close inspection of Patrick’s credentials and the organizations who issued them reveals an interesting web of self-aggrandizement and false claims. Apparently this “ordination” was still insufficient because Patrick then appears to have marketed himself just down the street and one zip code over from RSI, and joined another dubious organization called Jewish Spiritual Leadership Institute (JSLI) for ordination, which is without question founded and run by individuals who are ordinarily banned from the rabbinate and cantorship (however, their Director Steven Blane never receiving official rabbinical ordination himself, apparently at one time only being member of the Cantor’s Assembly and not the actual rabbinate, see his profile at JSLI). And he isn’t the only strange character on the radar. Patrick admits that he was a student of Rabbi Johnathan Ginsburg, and studied through “Rodfei Kodesh,” for para-rabbinic ordination. Ginsburg is also like many of the JSLI leadership too, he also claims his line of authority stretching from the Conservative Movement. In reality Ginsburg has been formally disavowed for irregularities related to conversion and ordinations. Part of his withdrawal from the Conservative Movement might have been further pushed along by a sexual abuse and exploitation suit from a convert and rabbinic student. 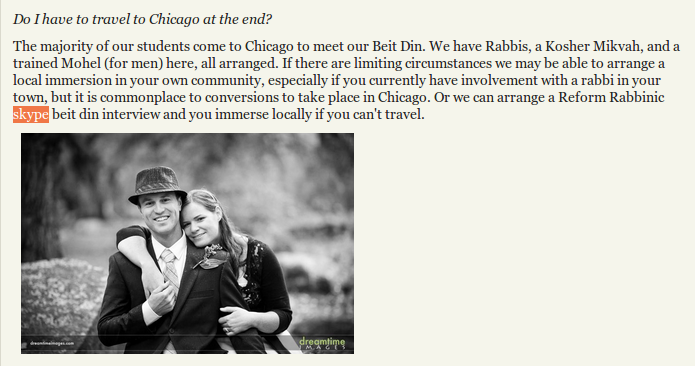 “The Chicago Conversion Beit Din advertises that it will provide its students with a “Conservative Bet Din.” The Rabbinical Assembly, as the world’s sole membership organization of Conservative/Masorti rabbis, wishes to clarify that, as a body, we do not endorse the work of the Chicago Conversion Beit Din and will not endorse conversions completed under its auspices, for any purpose, including to seek citizenship in Israel under the law of return. Once one closely looks at the programs of PunkTorah, JSLI, eSynagogue, etc. you will see that they all pretty much are doing the exact same thing. Though independent in appearance, they all point back to the same personalities and mutually aided self-aggrandizement. One cannot help but wonder if this is just a headless blunder, or if this is actually a kick-back system. One cannot help but wonder if they are attempting to corner the market to unsuspecting people through simultaneous branding and outreach attempts, and then sharing the profits. Simply put, in the crude parlance of the punk culture from which I come, this all appears to be a circle-jerk by a bunch of poseurs. There is no credibility in the conversions of PunkTorah/OneShul and their affiliates, neither is there in the ordinations of Patrick’s matching Darshan Yeshiva. One doesn’t need to wait and see if these “halachic” rulings by them are going to be challenged and thrown out, they have already been formally disavowed higher up their chain of command so the matter is settled. As I’ve stated, the fact that there is collaboration is evident from their timing and cross over in promotional videos (see below). Just a few months before Patrick made himself “Rosh Yeshiva” of his own Darshan Yeshiva, he was directing people to get ordination through JSLI. They are all different faces of the same beast. They all seek to not just convert, but also create their own rabbinate. So why should one make such a big issue out of a runaway sect? Aside from disrespecting the values of Judaism and the dignity of the rabbinate, the PunkTorah venture has been greatly funded but the Jewish Federation of Greater Atlanta. It is appalling to both the affiliated and un-affiliated that Federation monies, which are not to be used for politics or dogma, are being utilized for this program. 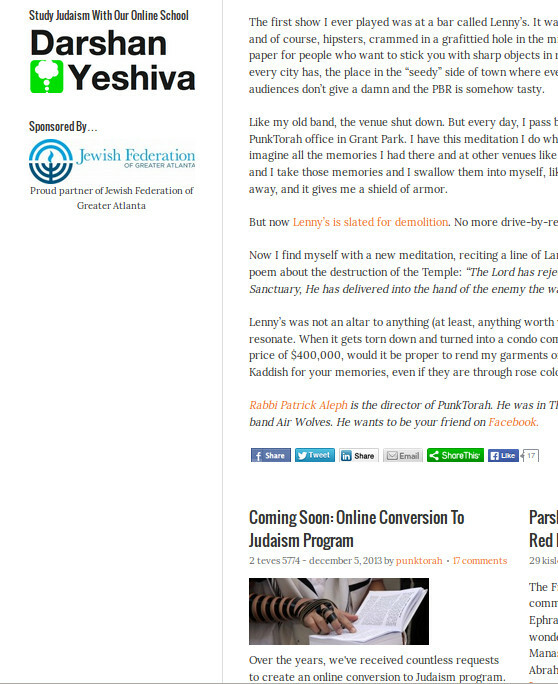 Not only was PunkTorah / OneShul funded by the Federation, their site still bares the branding by the Jewish Federation of Greater Atlanta to give them the appearance of respectability. This in and of itself is appalling and insensitive of the feelings of the Jewish community for them to use Federation resources for engaging in overtly provocative endeavors related to our community’s religious politics. Federation money should not be used for sectarianism, let alone the formation of new rogue sects. This program is both defrauding the Jewish Federation, and the members of PunkTorah who turn to them for religious rulings and ordinations. Many followers of Patrick are extremely desperate for the conversion they have not been able to attain by other means. People who badly want this program to be legit in their minds, so they are fiercely defending this potential conversion program. 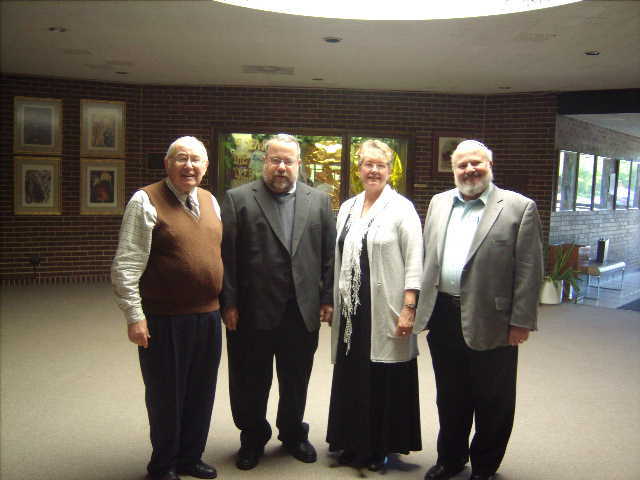 Little are they keeping in mind of the reality that no matter how they perform their conversion with these people, they will not be recognized by any of the official Jewish movements in North America; Reconstructionist, Reform, Conservative and of course Orthodox. Neither are they valid in Israel. A person that is seeking a valid conversion from a recognized beit din are best advised to join and convert through a local program. Any conversion by a valid and recognized beit din, which is verifiable and properly performed, will be recognized not just by their movement here, but is generally valid for immigration to Israel as well (while not recognized according to Orthodox law and standards, one is still applicable for aliyah under the Law of Return according to the civil law of Israel). Anyone who is offered a mere partial conversion is advised to run and not walk. As Patrick “Aleph” doesn’t believe in transparency and accountability, he has begun to delete his social networking connections and locking his damning videos. Though on the surface it appears that Patrick and his cohorts are simply being more compassionate and innovative, in reality their actions have left several of their most ardent fans and contributors feeling hurt, misled, shamed and defrauded. Even worse it is causing a crisis of identity for potential converts who feel that they have now been further alienated and stigmatized though the false hopes offered them by PunkTorah and Patrick. Keep in mind, PunkTorah is already funnelling people to Ginsburg for conversions, Patrick is merely attempting to go one step further in doing it himself now. I feel for these potential converts. Sincere people, who don’t deserve to have their experience with Judaism soured by the actions of people who don’t actually represent the Jewish community in any true capacity. I can’t think of anything more cruel for an individual to face than for them to be told they are not Jewish, an issue that wouldn’t be such a wound had it not been for sheisters who fed them false hopes and an unfounded sense of entitlement. People playing with the emotions of the helpless. I feel sorry for the people who are already too emotionally crippled by stigma to recognize they aren’t being faulted for being a convert, but for their association with people of bad reputation. This is some semi-good advice from some sketchy people who have already tried going there. People who have learned the hard way that no matter how you perform it halachically, conversions will be rejected outright and summarily when performed outside of the auspices of a recognized rabbinate authorized for this function. Any movement, be it conservative or liberal, is only going to recognize the rulings of people whom they recognize to be rabbis. To expect anything different is just childish and ignorant on a paramount level. The bottom line is this, the only weight a conversion certificate has comes from the name of the Rabbi that signs on the dotted-line. Unfortunately the leadership of PunkTorah and their affiliates/associates may have already soiled their reputations in a manner which can’t be laundered, no matter how pricey of a mikveh fee you pay to a self-appointed group.